Analysis by the IMF and Rystad Energy showed North Sea oil producers would be among the hardest hit by the slump in prices because huge operating costs meant they could not absorb the decline as easily as countries such as Kuwait, Iraq and Saudi Arabia. "Canada, the North Sea, and the United Kingdom are among the most expensive places to operate oil fields. As a result, the oil price slump will affect production in those locations earlier and more intensely than in other locations," the IMF said in its World Economic Outlook. The fund’s oil industry analysis showed that UK producers faced the highest operating costs in the oil producing world, equating to an average of around $40 per barrel. 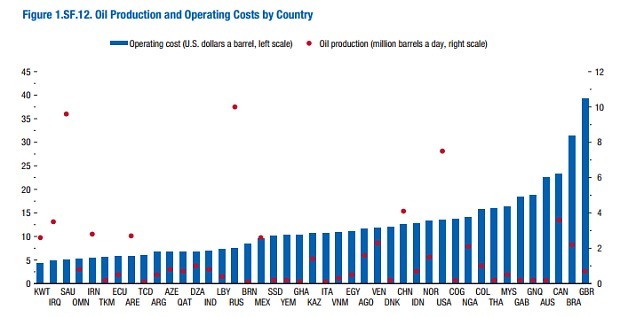 By comparison, operating costs were less than $5 a barrel in Iraq and Kuwait, and about $6 on average in Russia. The figures will deal a further blow to the Scottish nationalists who have claimed North Sea revenues could help sustain an independent Scotland. Oil prices have fallen from their high of $115 a barrel to just $36 today. While this has led to a collapse in the use of oil rigs, most notably among US shale oil producers, the IMF said "significant efficiency gains" in the sector would help to limit falls in production. "Projections from Rystad show that lower oil prices are expected to have a smaller impact on production of shale oil in the United States than on deepwater and oil sand production, especially in Brazil, Canada, and the United Kingdom," the IMF said.